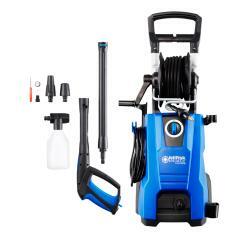 This powerful Nilfisk easily handles larger and frequent cleaning tasks. With 7-levels of pressure control at your fingertips, the PowerGrip™ not only gives you fine control over a variety of cleaning tasks but also the ability to save energy and water when higher pressures are not needed. The telescopic handle, sturdy wheels, long hose and one-hand operated hose reel all ensure the ease-of-use you want, when working for longer periods of time. PowerGrip™ for easy in-hand pressure control. Helps you save energy and water.